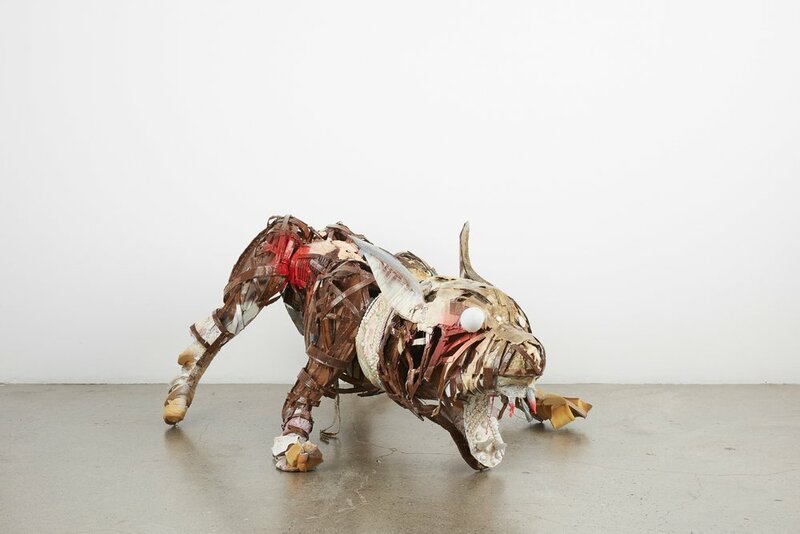 Lavar Munroe, 2017, Attacked on the Master’s Command, Cardboard, sponge, string, fabric, latex paint, foam, spray paint and beads, 41 x 29 x 24 inches Courtesy of the Artist and Jenkins Johnson Projects, NY. Lavar Munroe is an interdisciplinary artist whose work encompasses painting, drawing, sculpture and installation art. 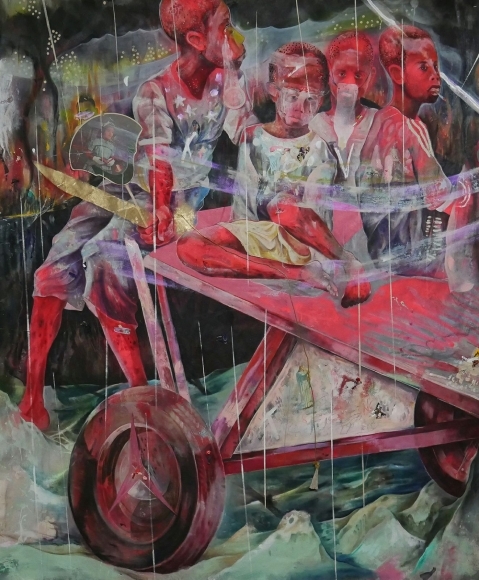 Blending fictional narratives, reminiscent of dark childhood fables, with his own direct experience with research and art historical compositional techniques, Munroe constructs sharp political critiques of contemporary life. Born in Nassau, Bahamas, Munroe earned a BFA from Savannah College of Art and Design (2007) an MFA from Washington University in St. Louis and attended the Skowhegan School of Painting and Sculpture (2013).Munroe’s work has been exhibited in institutions such as The Mildred Lane Kemper Art Museum, the Orlando Museum of Art, the National Art Gallery of the Bahamas, the Nasher Museum of Art, the Contemporary Art Museum of Raleigh, the SCAD Museum of Art, Museum of Contemporary African Diasporan Arts (MoCADA) and upcoming at the Museo Nazionale delle Arti del XXI Secolo (MAXXI), and The Meadows Museum, among others. His work was included in 56th Venice Biennale (2015) and the 12th Dakar biennale (2016), and Prospect New Orleans (2018). In 2010, he represented the Bahamas at the Liverpool Biennale. Munroe was the recipient of the Josef and Anni Albers Foundation: THREAD Senegal residency (2017) and the Distinguished Alumni Award from Sam Fox School of Art and Design at Washington University in St. Louis (2017-18) and recently completed a residency at the Headlands Center for the Arts, Marin County, CA. Munroe has also been awarded the Joan Mitchell Foundation Painting and Sculpture Grant (2013), a Postdoctoral Fellowship at the University of North Carolina at Chapel Hill (2014) and a Postdoctoral Award of Research Excellence from University of North Carolina at Chapel Hill (2015). Paintings and sculptures from Muroe’s recent body of work, The Redbones will be included at the Barracks at the English Camp and at studio e including a series of GUN DOGS created on site for the installations.